Had pho for dinner tonight! I realized I didn’t have pho for a while, and hadn’t been to my favorite pho place in the South Bay in months! Pho is one of my comfort foods; when I was a kid, my family would get pho in Oakland Chinatown almost every week (it is now under a different management, sadly). My parents grew up in Saigon, where they’d occasionally have pho from street vendors. Pho can be very filling and good for cold weathers. Pho with tai, chin, nam, and gan – rice noodle soup with rare beef, well-done brisket, flank, and tendon. A plate of bean sprouts, lemon wedges, jalapeno peppers, and Thai basil was also served. I added all of those ingredients and also asked for hanh dam, which is vinegared onion. I also eat the meats with hoisin sauce and Sriracha sauce. I’ve eaten with friends that put fish sauce (not nuoc mam, but the concentrated fish sauce), Sriracha sauce, hoisin sauce, and/or sugar into their pho. I’ve also tried their soup at the end… it’s entirely different than what I’m used to. It’s pretty interesting how each person’s pho tastes the same at the beginning but totally different at the end. Most of my friends/family dislike my pho because I add bean sprouts, lemon juice, and jalapeno pepper to my bowl, but I love it! Phở is a Vietnamese noodle soup consisting of broth, linguine-shaped rice noodles called bánh phở, a few herbs, and meat. It is a popular street food in Vietnam and the specialty of a number of restaurant chains around the world. Pho is primarily served with either beef or chicken. The Hanoi and Saigon styles of pho differ by noodle width, sweetness of broth, and choice of herbs. 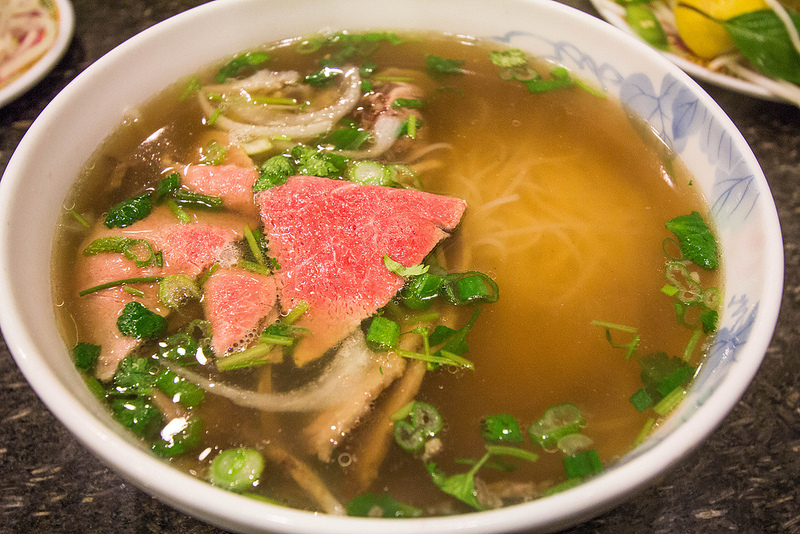 The origin of pho and its name is a subject of scholarly debate. Pho originated in the early 20th century in northern Vietnam, apparently southeast of Hanoi in Nam Định Province, then a substantial textile market. The traditional home of pho is reputed to be the villages of Vân Cù and Dao Cù (or Giao Cù) in Đông Xuân commune, Nam Trực District, Nam Định Province. According to villagers, pho was eaten in Vân Cù long before the French colonial period when it was popularized. In the late 1920s, various vendors experimented with húng lìu (a seasoning made of ground cinnamon, star anise, thảo quả, and clove), sesame oil, tofu, and even Lethocerus indicus extract (cà cuống). This “phở cải lương” failed to enter the mainstream. Phở tái, served with beef cooked rare, had been introduced by 1930. Chicken pho appeared in 1939, possibly because beef was not sold at the markets on Mondays and Fridays at the time. With the Partition of Vietnam in 1954, over a million people fled North Vietnam for the South. Pho, previously unpopular in the South, suddenly took off. No longer confined to northern culinary traditions, variations in meat and broth appeared, and additional garnishes, such as lime, bean sprouts, culantro (ngò gai), cinnamon basil (húng quế), and Hoisin sauce (tương đen), became standard fare. Phở tái also began to rival fully cooked phở chín in popularity. Pho is served in a bowl with a specific cut of white rice noodles in clear beef broth, with slim cuts of beef (steak, fatty flank, lean flank, brisket). Variations feature tendon, tripe, or meatballs in southern Vietnam. Chicken pho is made using the same spices as beef, but the broth is made using only chicken bones and meat, as well as some internal organs of the chicken, such as the heart, the undeveloped eggs and the gizzard. The several regional variants of pho in Vietnam, particularly divided between northern (Hanoi, are called phở bắc or “northern pho”), and southern pho (Saigon, called phở Sài Gòn). Northern pho tends to use somewhat wider noodles and much more green onion, and garnishes offered generally include only vinegar, fish sauce and chili sauce. On the other hand, southern Vietnamese pho broth is slightly sweeter and has bean sprouts and a greater variety of fresh herbs. The variations in meat, broth, and additional garnishes such as lime, bean sprouts, ngò gai (Eryngium foetidum), húng quế (Thai/Asian basil), and tương đen (bean sauce/hoisin sauce), tương ớt (hot chili garlic sauce) appear to be innovations made by or introduced to the south, also called Pho Sai Gon (“Saigon Style” Pho). Southerners eat pho for breakfast and occasionally lunch, whereas northerners eat pho at any time of day. hello. actually Pho is from the north! and it was, in the beginning, primarily breakfast food!! it became so popular in the south that most everyone now believes that it is from the south! yep, it’s mentioned in the post… northern and southern pho are distinct. i had the southern pho. I never knew there was a difference between the types of pho in the North and the South. Here in Southern California, I think you can pretty much only find the southern type. I love pho! It’s pretty much the same way in the SF Bay Area. I have never had northern pho before, but have heard that it’s different than the southern. There was apparently a restaurant in San Jose that served northern pho, but it’s now closed… However, there’s a small chain in SF that I found through Yelp; I will have to go there eventually!